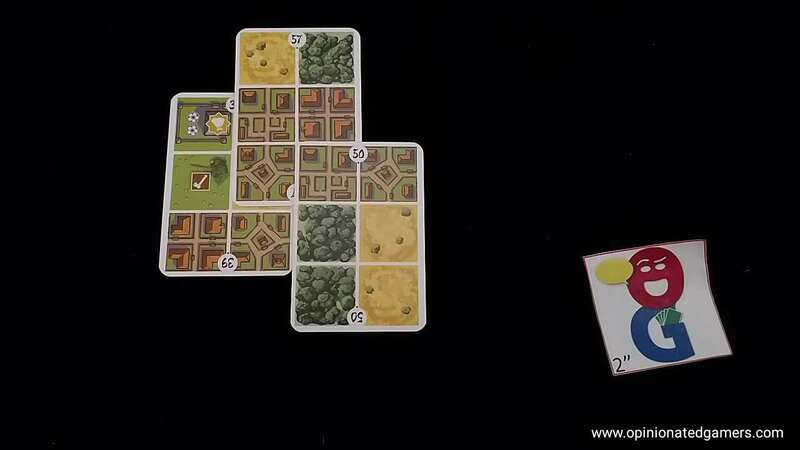 I was immediately interested in Honshu after reading a short paragraph long description from the publisher – after all, I don’t think that I’ve ever played a trick-taking/tile laying game before… I was already scheduled for a meeting with the nice folks at Lautapelit during Essen, and after getting the full demo, this was on my really-have-to-play-at-the-first-opportunity list. The game itself is composed mainly of a deck of 60 cards and a handful of wooden tokens. 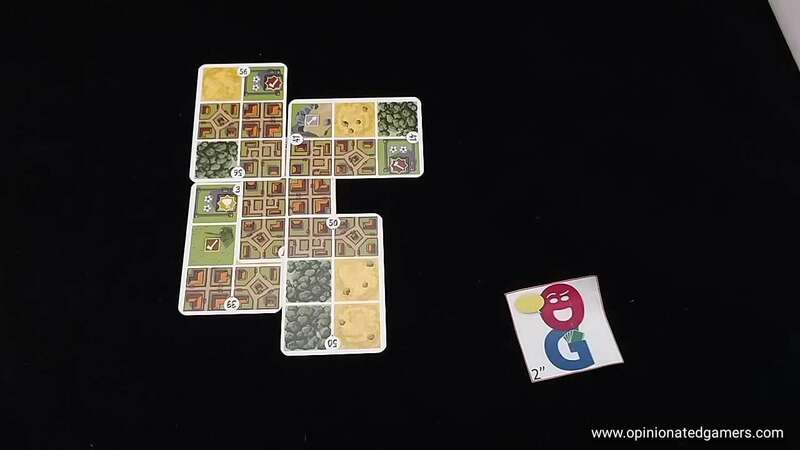 The game is split up into 12 rounds – each with a trick taking phase and then followed by a “tile laying” (or more specifically, a card laying) phase. 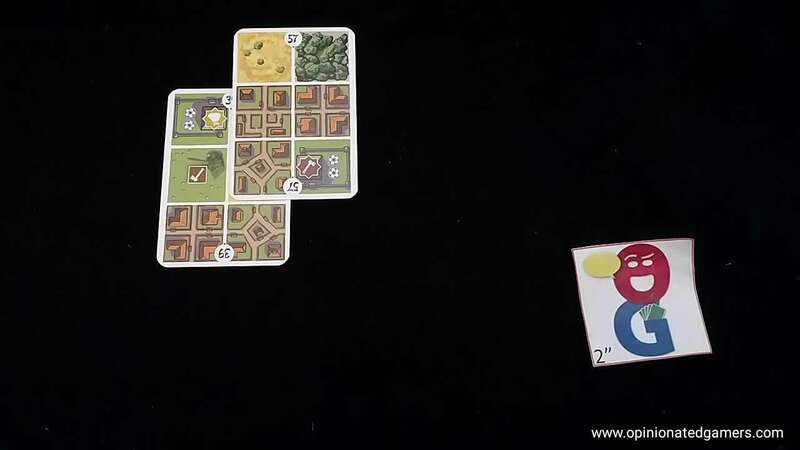 Each player gets a starting card – one side allows for an identical starting position while the back gives an asymmetrical start. Player order cards are randomly dealt to players for the first hand. The deck of cards is shuffled, and players are dealt 6 cards each. The player with the “1” player order card always leads the trick; he plays any card from his hand to the table. The cards are numbered from 1-60, with the higher number being the more powerful card. Cards are played in ascending player number order. At any point, a player can add a cube to his play – there are four different colors of cubes, and I’ll go into how you gain them in a sec. A cube adds 60 to the value of his card. For the rest of this trick, all other cubes played must match the color of the first cube played to the trick. When all players have played a card (and possibly an accompanying cube), the trick is resolved. The player with the highest valued card takes the “1” player order card and other players take the next numbered card in descending card values. The “1” player then chooses any of the cards on the table to pick up – and this will later be added to his tableau. In descending number order, each player takes one of the remaining cards which was played to the trick. 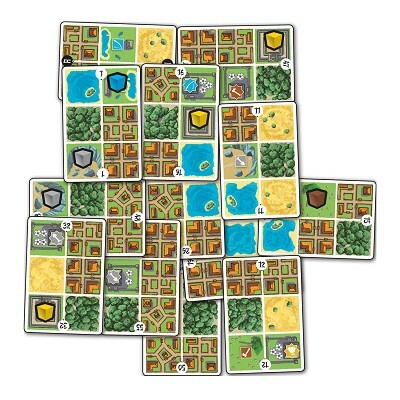 When all players have collected a card, the game moves to the map-laying phase. In the map phase, you take the newly gained card and add it to your tableau. At least one cube of the 2×3 grid on the card must either go over or under an existing part of your tableau. One exception is that lake sections may never be placed underneath other cards. If your newly placed card has an exposed resource production square visible after placement, you place a goods cube of matching color on that square. If you cover up a cube on a previous card, that cube is discarded. At this point, the game goes to the next round. There are a few special rules at the end of each round that is a multiple of 3. At the end of the 3rd round, the three remaining cards in your hand are passed to the player on the left to form their hand for the next round. At the end of the 6th round, all players should be out of cards, and as such, each will get a new hand of 6 cards for the 7th round. At the end of the 9th round, the three cards remaining in your hand are passed to the player to your right. And at the end of the 12th round, there is final scoring. At the end of the game, you score your city. 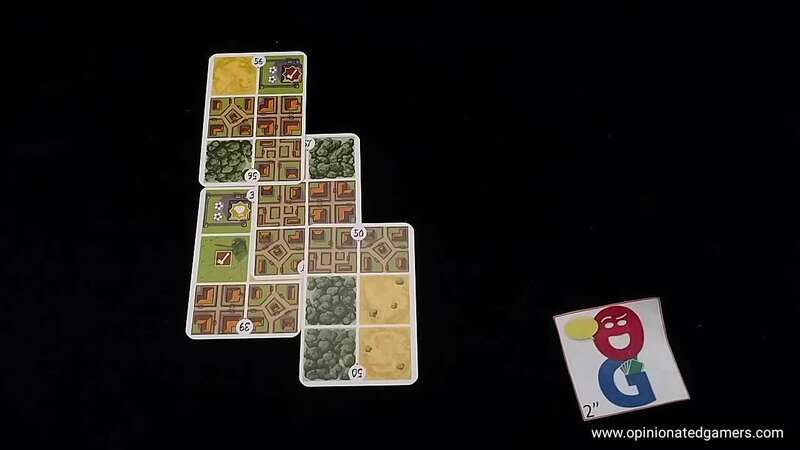 Each type of terrain has a separate scoring rule. 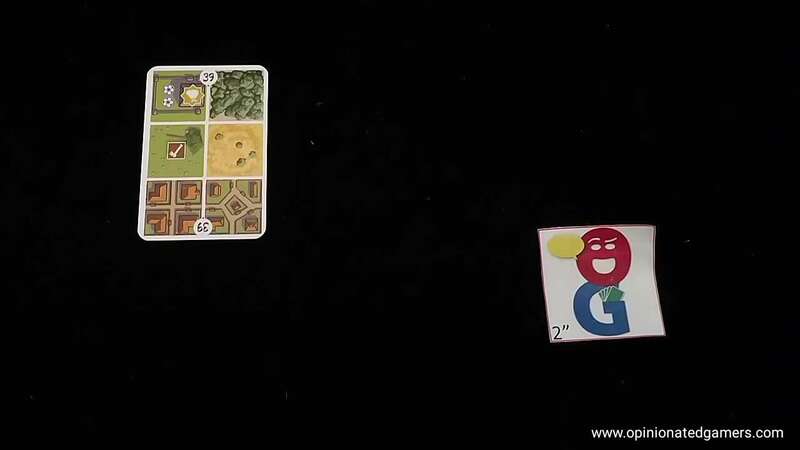 There are additional advanced scoring cards which can be used, if agreed upon at the start of the game. There are 8 different cards, and one is randomly drawn before the game starts and is visible to all players throughout the game. If you are playing with a special scoring card, then apply this rule in end-game scoring as well. The player with the most points wins the game. If there is a tie, the player with the most fallow (desert) squares showing is the winner. This is a surprisingly complicated game in a small package. After playing a few times, I think that it may not be correct to call it a “trick-taking” game – in the end, you are playing cards and the rank of those cards determines which card you get to pick, but it doesn’t feel like winning a trick. In any event, there is a lot of stuff going on in a turn. What you choose to play is determined in part by what you want to add to your city, what you think your opponents are going for, what other cards have already been played to the “trick” by earlier opponents, where you are in turn order, whether or not you have appropriate colored cubes to play to the trick, etc. Suffice it to say, this is a game that could possibly provoke Analysis Paralysis if you let it due to the vast number of things to consider when playing and choosing a card. On the other hand, it’s also the sort of game where you could just go with your gut feeling, throw a card out and then figure it out when it’s your turn to choose cards. For me, I tend to choose my cards quickly and just figure it out later. If there’s a card I really want, I’m definitely not afraid to throw a cube out on the card – but like everything else in the game, it all depends on what you have going on. As you collect cards and hopefully factories, you then get a good feeling for what a particular cube is worth to you point-wise; and this in turn helps you decide whether or not you should use a cube to increase the rank of your played card by 60 versus saving it to play on a factory at the end of the game. Another thing to consider is the opportunity cost lost by keeping a cube on a card. You can always play a new card on top of a cube space, but if there is a cube there already, it is discarded. If you play the cube, even in a suboptimal play, you do then open up the chance to overbuild that spot with a later card. Lorna: This game is right up my alley. Tile (card) placement with a puzzle aspect. Plays surprisingly well with the 2 player rules. 2 cards are set out from the deck as a pair and then the players each play a card to form the second pair. High card played chooses which pair they want and discards one of the cards and puts the other into their tableau. If the player who played the lower card gives up 2 resources they can trump and choose first. It’s easy to learn, quick to play and interesting. I like it a lot. My initial plays have not quite had the delicious tension and agony of making a decision to love it, but maybe with more plays that will come out. Doug G.: Very enjoyable after 1 play. I’m not a huge trick-taking card game lover, but this doesn’t feel like one (I’ve heard it described as ‘turn order selection’ instead), and I found the area-building aspect quite enjoyable. Quick and doesn’t outstay its welcome. Joe Huber (2 plays): This isn’t a trick taking card game, though there is a trick-like ordering to the play. Of the Essen releases I hadn’t played as prototypes, this is my favorite game so far, well on its way to an “I love it!” rating, if not quite there yet. A friend described it – fairly – as Pi mal Pflaumen meets Patchistory, but I like to think of it as Zum Kuckuck meets Hanging Gardens. Chris Wray (2 plays): I share everybody’s enjoyment of the game. I found it clever, and arranging the “maps” reminded me a little bit of the game Limes. As everybody points out, this isn’t quite trick-taking — you don’t actually take a trick, per se — but the turn order selection mechanic works well. I’ve found the game straightforward, and everybody I’ve played with has really enjoyed it. This likely has a permanent spot on my shelf. 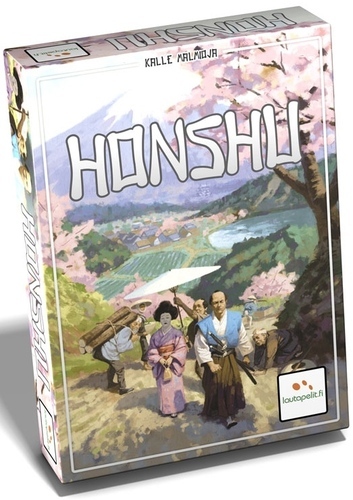 Craig Massey (3 plays): Honshu has been a pleasant surprise thus far. It is most certainly not a trick taking game. The game feels fresh and interesting yet familiar all at the same time. I suspect there is much more depth to it than the initial plays might reveal. If I’m looking at the recent fall releases as a whole, this is very likely the first game to earn a long term spot on the game shelf. I love it! Dale Y, Chris W, Craig M.